Reusable Hot Cold Compresses for injury treatment and therapy: These reusable heat packs and reusable cold packs are great for many first aid and injury treatment needs. The best thing is that our reusable hot cold packs can be stored in the freezer and ready for cold therapy, or heated in a microwave as a hot pack. 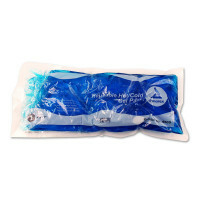 We carry both the popular Jack Frost brand reusable cold pack (reusable as a hot pack, too) and our own brand. Both these reusable flexible ice packs / heat packs are gel filled and versatile. Our reusable hot and cold packs are available at wholesale and bulk buy, too. Also see: Ice Wrap Instant Cold Packs Heat Packs & Warmers NEW! Hot or Cold Pack? Learn When and How to use Heat and Cold for Injuries! Reusable Hot & Cold Compresses - For First Aid Treatment of Aches and Injuries - Cool Kids Cold Packs, Too!